The fare forecasts made through the Kayak website attempt to answer a key question that stockbrokers and budget travelers have on their lips: When should I buy? Like stock prices, airfares rise and fall with little or no notice. Making a fare forecast is difficult because the price changes frequently make little sense. Before the rise of the internet and the ease of repeatedly checking fares online, most travelers followed this simple advice: If it's a reasonable airfare, book it. That's still very good advice. But most travelers still hope to find the best price possible for flights. Few want to buy if prices are falling. Everyone wants to wait until the cost hits rock-bottom. Like the stock market, it is extremely hard to know when this has happened. Kayak is a travel search engine that allows travelers to shop for travel products and then provides links for making final purchases. Although Kayak is owned by the Priceline group, it connects with a host of airlines, hotel chains, car rental companies, cruise lines, and other travel providers. It's an online tool that has been used millions of times. So when Kayak taps into its own data and begins to draw conclusions about when to buy tickets or where prices are likely to go, a budget traveler should pay attention. Its findings won't be flawless, but they are based upon much experience in the marketplace. Travelers have made more than 1 billion search queries on various Kayak sites. Perform an ordinary search on Kayak between destinations. Along with the results, the advice to buy or wait will appear in the upper left section of the results page. Click on the color-coded advice and you'll see a pop-up window with more information. Kayak will express a degree of confidence that its forecast is valid in a "buy" message that appears in one pop-up window: "Our data scientists think these are the best prices you'll see for the next seven days. Like weather forecasters, though, they can't be 100 percent certain. Our purchase advisory, shown here, is an analysis based on current and past prices." Another buy message might be price-specific: "Our model strongly indicates that fares will rise more than $20 during the next seven days." That reads a lot like an investment disclaimer. Searches for flights that are less than one month away are quite likely to get the "buy now" advice. As your lead time increases, you'll see more "wait" messages, which are printed in blue with a downward-pointing arrow. You'll be advised prices are likely to drop in the next seven days. Note that on some routes, no fare forecast is given. When that occurs, it's because Kayak did not have enough data upon which to form its educated guess. 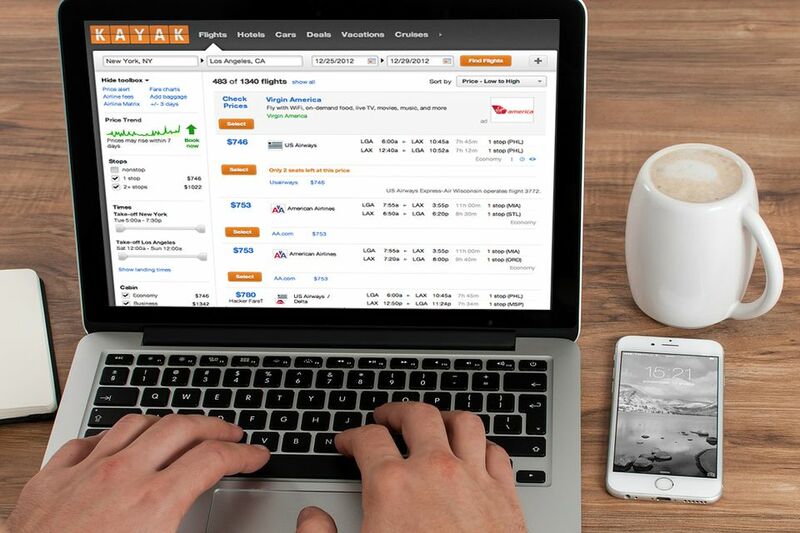 Kayak has an easy-to-use feature called Explore that allows travelers to see low fares by destination and compare the costs of alternative airports. This feature, found under "More" in the toolbar at the top of the Flights page, attempts to advise you on that all-important buying question—when to make your move—as the search unfolds and whether you might find better options by changing the destination or the dates they plan to fly. You can check for specific dates or a range in a block of time. Change the dates and length of stay to see different fares. "Our algorithm incorporates data from multiple faring and availability providers across the over 1 billion annual queries performed on Kayak sites and mobile apps," said Kayak chief scientist Giorgos Zacharia in a company blog post about the fare forecast system. "As we continue to collect data and test the algorithm, the forecast accuracy will continue to improve." Kayak also allows you to set up a fare alert for your chosen route with a single click if you want to keep a close eye on fares to your destination without continually checking the Kayak website for changes.